Can I absorb the credit card fees myself? Yes, you can choose to absorb the credit card fees yourself rather than pass them on to the participant. 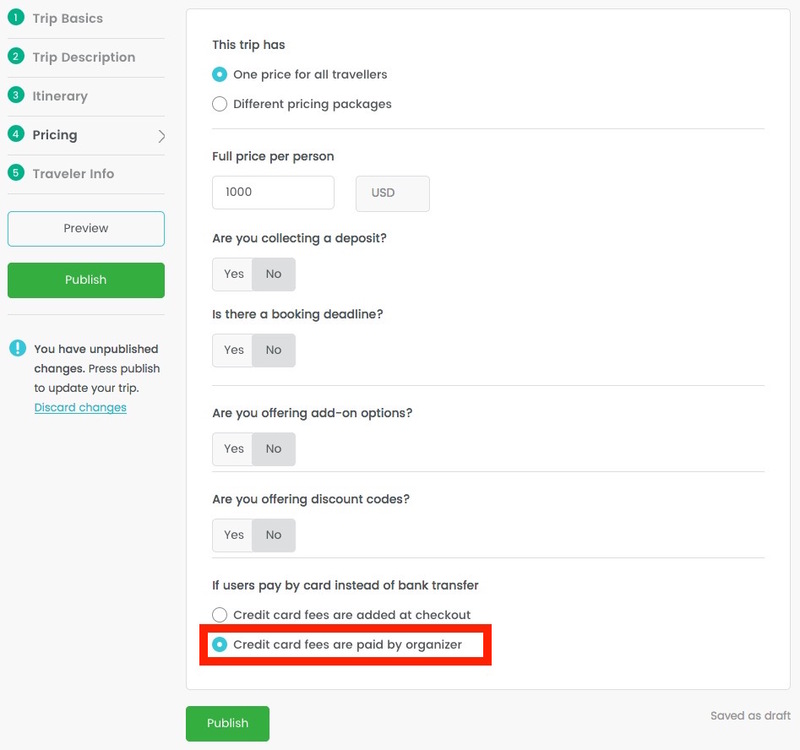 You can select this in your trip builder by clicking on "If users pay by card instead of bank transfer" and choosing "Credit card fees are paid by organizer". If a user pays by credit card, your combined transaction and credit card fees are 3.9% (1% + 2.9%) for Visa/Mastercard or 4.9% (1% + 3.9%) for AMEX. If the user chooses to pay with their bank account, your fees will still be only 1%. If a user pays by credit card, your combined transaction and credit card fees are 2.4% (1% + 1.4%) + 30cent/transaction. If the user chooses to pay with their bank account, your fees will still be only 1% + 30cent/transaction. If a user pays by credit card, your combined transaction and credit card fees are 2.9% (1% + 1.9%) + 30p/transaction. If the user chooses to pay with their bank account, your fees will still be only 1% + 30p/transaction. The new European payment rules (PSD2), which went into effect January 13 2018, bars companies from adding credit card surcharges. You may only choose "fees are added at checkout" if you are organizing a family&friends trip. If you are using WeTravel in a professional capacity, please choose "fees are paid by organizer". If a user pays by credit card, your combined transaction and credit card fees are 3.5% (1% + 2.5%) + 30cent/transaction. If a user pays by credit card, your combined transaction and credit card fees are 3.5% (1% + 2.5%) + 5 ZAR/transaction.